Talking about F1: The F1 blog: Alonso, McLaren and 'inconsistencies' - is everyone actually telling the truth? Alonso, McLaren and 'inconsistencies' - is everyone actually telling the truth? So goes the scientific adage. And from hearing the words of Fernando Alonso in Malaysia's pre-race drivers' press conference, we can empathise. Therein it was the first we'd heard from Alonso directly since his pre-season testing accident in Barcelona, which had kept him out of both the final test and the opening round proper in Melbourne, on his view on what happened. It was a crash that already had elicited much mystery and no little speculation. To many it came with a certain whiff that there was a lot more to it than we knew. Alonso's account given in the press conference was clear. But the problem was that it on the face of it seemed incompatible at various points with what his McLaren employers had claimed before. Of course the response from some was predictable; presumably a few had been like a compressed spring desperate to be released. Some started from McLaren sympathy or from Alonso antagonism; there were a few commenting from the opposite predispositions too. The favourite hits of old were struck up - McLaren's lying again; Alonso's not a team player; that's him and Ron Dennis at loggerheads as predicted and ahead of schedule. 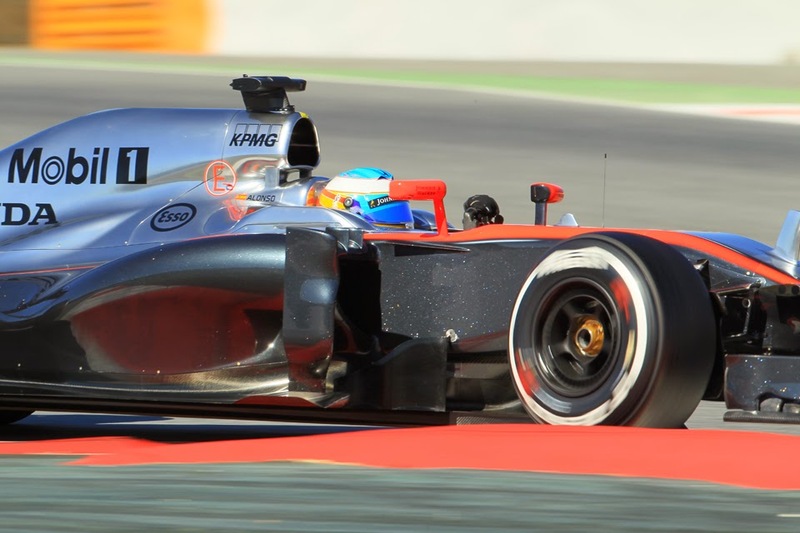 One headline in Motorsport magazine's website - atypically shrill - stated that 'Alonso throws McLaren under the bus'. I even stumbled across a couple of predictions that Nando wouldn't last the season at Woking (I'll offer them evens that he will...). Yet whatever the predisposition one thing that most agreed on was that someone wasn't telling the truth. That driver and team were singing from different hymn sheets. And as a consequence Alonso's fresh words created more questions than answers. But should we assume that there's malign intent here - deliberate lying - from either party at all? Might it be even that the claims aren't quite as contrary as has been thought? As Ben Anderson of Autosport for one has outlined the more you dig into Alonso's words, getting beyond the screechy headline responses, the more that the supposed 'inconsistencies' between his and his team's accounts in fact appear to evaporate. The main supposed inconsistency was in the cause of the crash. Alonso said in the conference that his steering 'locked to the right'; McLaren had said it has found no evidence in its data for a mechanical failure (though added more latterly that its driver had reported that the steering in advance of the crash felt 'heavy', albeit not in a verbatim quote). A contradiction? Well, no actually. Not necessarily at least. Plausibly both can be true. Just because you've found no evidence in your data doesn't mean it didn't happen. No system is all-encompassing, not even in F1. And that McLaren confirmed in recent days that it's 'fitted an additional sensor to the car to increase our data capture' suggests there was a gap in its ability to measure these things also. In fairness to Alonso too, he has conceded that his claim is not corroborated by the data that there is, stating in the conference that: 'I think it's clear that there was a problem in the car but it hasn't been found on the data at the moment...there are some spots here and there but there is not a clear answer'. Also, for what it's worth, Alonso's recollection of locked steering seems consistent with those - such as Bernie Ecclestone and Flavio Briatore - who've seen CCTV footage of the crash and have commented on the apparent visual 'strangeness' and apparent low speed of it (Briatore indeed said 'Fernando crashes without any apparent reason...We have to see if there is a steering problem'). It also is consistent with the reported account of at least one observer at the scene that Alonso didn't touch the astroturf on the outside of the corner before leaving the track, contrary to McLaren's account that it was there that he lost control. Reportedly too the telemetry shows that in the three seconds between him leaving the tarmac and hitting the wall he was braking and downshifting but not steering, which again is consistent with Alonso's claim. While even a few of those highly sceptical of Alonso's account - such as Mark Hughes - have conceded that such a steering 'lock' while unlikely is at least possible, such as via a momentary heavy spot from the hydraulic power steering. And as Sherlock Holmes used to remind us, one should never confuse the impossible with the merely improbable. McLaren according to Anderson has admitted also that what it said on the crash initially, such as that it could have been caused by a gust of wind and that Alonso lost it on the astroturf, was hasty, 'in the sense that it was not released with a full grasp of the facts', and was mainly motivated by a desire to fill the vacuum that was sucking in rather wild theories as to what happened. But that, in addition to team boss Ron Dennis's notorious subsequent news conference wherein for reasons best known to himself he said that Alonso had no concussion, something he publicly retracted later, ended up as counter-productive. The confusion from the Spaniard's words was also aided by apparently conflicting accounts of Alonso's condition after the hit. It was understandable too, as in the conference the man himself appeared to indicate that he'd not been unconscious at all right after the impact, being able to turn off the electrics and the like, prior to losing consciousness and memory when he was 'in the ambulance or in the clinic at the circuit but the doctors said this is normal because of the medication that they put you, just for the helicopter transportation and the checks that they do in the hospital'. In isolation this isn't entirely new information either, as Italy's Autosprint some weeks ago quoted Alonso's trainer and assistant Fabrizio Borra stating that the driver had been 'agitated' after the crash, causing medical staff to administer sedatives for his trip to hospital. 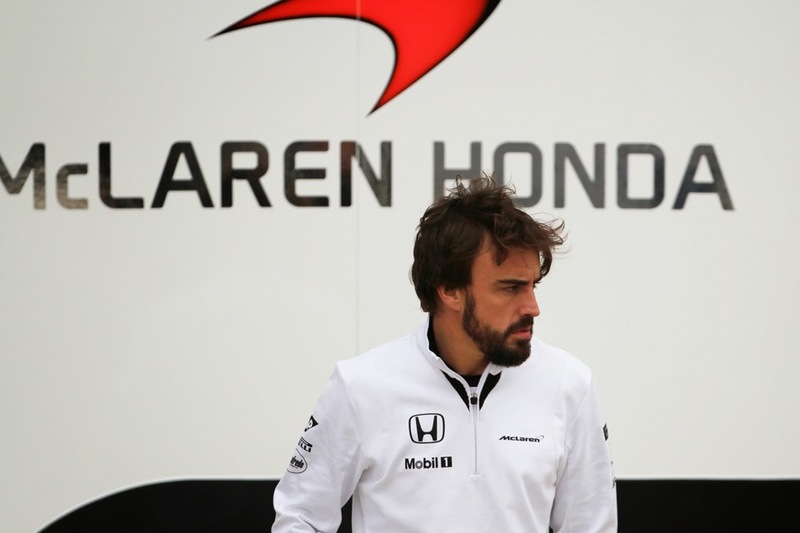 But again it struck as inconsistent with other evidence, such as from those at the accident scene that Alonso was unresponsive as well as from the team that he indeed had been unconscious. While in another interview later the same day Alonso clarified slightly by saying: 'one minute after the car stopped I don't remember anything more until I woke up in the hospital'. As Anderson pointed out though, human memory is fallible. And it's particularly fallible when recalling the time around that which your head took a hit and you drifted in and out of consciousness. Indeed we can think of stories from other sports such as rugby wherein players at the point of being taken off having been knocked out cold have argued with utter vociferousness that it never happened. Anderson added also that to take this to its logical conclusion it might explain an apparent recall of an error which never actually happened. So while it is possible that Alonso is mistaken we shouldn't leap to the conclusion necessarily that Alonso is being disingenuous in his claims. And no one involved disputes that he suffered a concussion, not even the man in question in the notorious press conference - 'Everything was more or less as a normal concussion...I had this concussion...'. Most broadly it's hard to see what the motivation is of either party to lie. Really, McLaren admitting a mechanical failure wouldn't be a particular biggie given racing cars often break (unless, as Anderson speculated, admitting such would have revealed some form of intellectual property or similar that it didn't want revealing); neither would Alonso admitting to a driving error, which he's done plenty before (including after Malaysia's qualifying session). Which would in the first instance lead us back to the suggestions that Alonso left the track due to some preceding medical condition, an electric shock, fainting after inhalation of battery fumes, or whatever (to trawl the most choppy of the speculation's waters). But these too for a few reasons have been debunked. A point that occurred to me too is that if Alonso is motivated by concealing a blackout or similar then surely the easiest thing by a way would have been to go along with the gust of wind/driver error theory, or to say he didn't remember. Instead he trashed the idea in rather resolute terms. Nando may be many things, but he's not stupid enough to miss a trick as glaring as that one. trying to tell the truth? Most broadly James Allen, the press conference compère, and sitting 10 feet away and square in front of the Spaniard, stated that: 'He (Alonso) looked tanned, fresh and above all calm. There was no agitation in his gestures, his speech nor in his general movement, unlike many other occasions where he has been stressed. He was clearly determined to keep it all together and not lose his patience and he didn't even come close for the best part of an hour. 'This was one of those press conferences with a certain tension in the air, but Alonso maintained a relaxed, calm exterior throughout, even when some of the Fleet Street journalists repeatedly pursued a line of questioning about how he could be happy to race this weekend if there was no explanation of the steering problem he was certain had caused him to crash.' So nothing there to suggest fibbing either. There's not much evidence of a frosty air in the team either. Ron Dennis - like his driver utterly relaxed and collected - added furthermore today that 'everybody was telling the truth and unfortunately people see a sinister side to that. We're telling the truth'. And that strikes me as the most plausible explanation, that all - driver and team - are acting in good faith, albeit admittedly in certain quarters and at certain points have handled the matter in rather a clumsy way. Not helped either by the element of mystery around a lot of it. But still, as Dennis says, we shouldn't assume anyone's telling porkies. And the accounts link up more than plenty are suggesting. 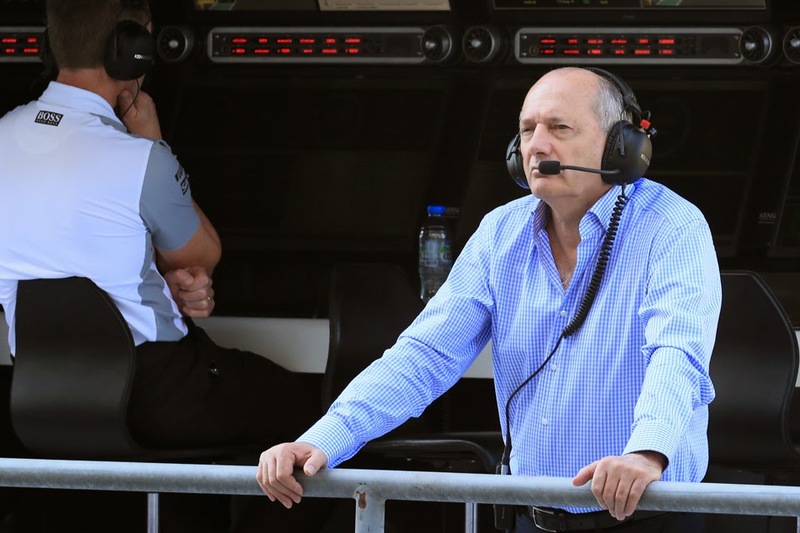 Martin Brundle today reported that Ron Dennis was 'remarkably calm' about the whole matter. Perhaps it's because within it there was little to get animated about.